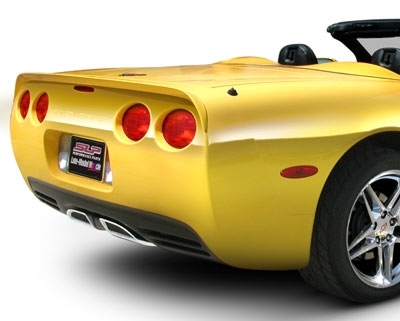 SLP's one piece, tape-on rear spoiler provides a subtle but elegant upgrade to the rear of your car, enhancing the already great appearance of your C5 Corvette. Unlike rigid fiberglass aftermarket spoilers, ours is manufactured from OEM-quality composite material, the same flexible material that GM uses to manufacture front and rear C5 Corvette FASCIAS. Each spoiler comes with OEM-quality double sided tape for an easy, tape-on installation (no drilling required). All necessary components, 3M tape and installation instructions are included. This spoiler will fit any C5 Corvette, including base, coupe, convertible and Z06. This item is custom painted to order and requires additional time to paint and ship. Please refer to current painting time on main website page"